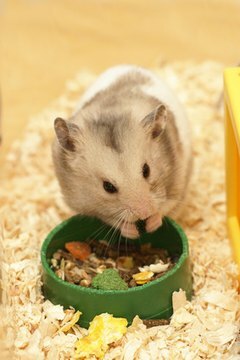 If you're considering a hamster for your child, choosing a larger variety can be beneficial. While small hamsters such as dwarf varieties are adorable, they're not the best hamsters for small children. They are hard for small hands to hold and can easily escape. The Syrian hamster is the largest of hamster subspecies; it has long-haired, short-haired and banded-hair varieties. Their larger size makes them easier to handle and keep up with, which makes them better for kids and parents. Don't let the name fool you. While the capybara is sometimes called the world's largest hamster, it's not a hamster. The largest hamster is the Syrian hamster, also called the teddy bear hamster and the golden hamster. Syrian hamsters get up to 6 or 7 inches in length, almost double the size of a dwarf hamsters, and prefer being housed separately. A Syrian hamster's habitat should be a minimum of 29½ inches by 15¾ inches by 15¾ inches. Syrians live alone except in rare cases. While you can house Syrian hamsters in wire cages thanks to the subspecies' large size, you want to avoid cages that have wire bottoms, which can be hard on their feet. Aquarium-style and plastic habitats are suitable as long as they are large enough. Aquarium-style housing should have a tight-fitting metal mesh lid to prevent escape. Substrate for the hamster can include pine shavings or white paper bedding but should never include cedar, which can cause respiratory issues. Provide nesting material. Hay is a good choice because it serves as both bedding and a food source. Torn up tissues without lotion or other chemicals and shredded paper are suitable. Of course, provide a water bottle and food dish, along with something to burrow in or under. Syrian hamsters are much easier for small hands to hold onto without risk of injury to the pet. Syrian hamsters won't slip through the bars of a cage. If they should escape, they're easier to find than their smaller cousins. Long-haired Syrians are also soft and cuddly. Syrian hamsters do not do well in pairs. They sleep during the day and have a short lifespan, of about two to three years. Syrian hamsters can be anxious and will bite, especially when excited small hands grab at them. It can take weeks to properly hand-train and tame a Syrian hamster. If your child isn't patient, a hamster of any size isn't the best pet for your family.